I bought the set screw at my local hardware store. The only thing that's really crucial is the 7/16-20 thread going into the throttle body itself -- what you choose to screw into the holes is totally up to you! Link for the elbow doesn't appear to work anymore. 1991 325i - Daily Driven lightly modded. 1988 325 M50NV swapped SETA (the free project). 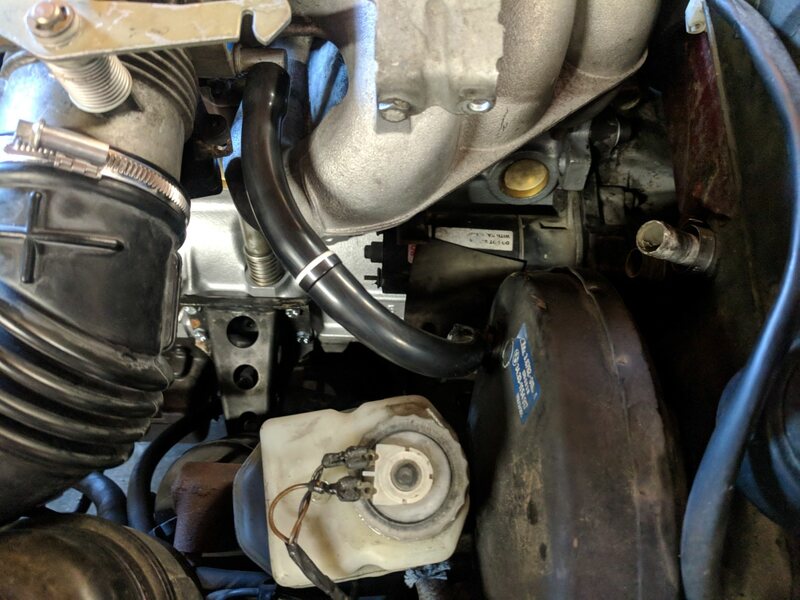 I would like to do this on my M20, however I have an '87 325is that was originally automatic so it has the two hoses and a connection to the intake boot. I like the simplicity of this and realized I can order a later model intake boot which doesn't have the port so I'm good there. First, what is that valve you have in the middle of your vacuum hose? The only valve I can find on RealOEM is the complex little check valve that is used with the two hose design. Second, why is that little brass pipe at the back of your throttle body plugged? Mine has a line leading to a valve/plug (I believe its the Evap Purge Valve) which then leads to the charcoal canister. Are you just not running a charcoal canister so you deleted the whole system? Ok since I posted my last comment I did a bit of research and think I have this figured out. If someone with experience could confirm this that would awesome. "Old hose on the left has what looks like an in-line check valve with OEM clamps. The fitting at the booster is just an elbow. The new part from Blunt is a check valve in the 90 degree fitting, plus new grommet." What I want to confirm is that if I bought this 90 degree check valve and put it in the place of the elbow fitting on the brake booster, I could then run a straight vacuum line from the brake booster to the throttle body correct? Another option that I found is by using an E21 vacuum check valve (part number 34331151533A), which is only $8, also available on ECS. With this you would run the original elbow fitting on the brake booster and then run the E21 check valve in line to the throttle body. It seems like these two options achieve the exact same results. Anyone know why the 90 degree check valve is superceded? Did they fail a lot or something? Or did they just realize that selling the complex 4 way check valve would be much more profitable? Who knows but my eta had the single like the pic you posted. Then when I converted to 325i motor I got the double check valve. Hey sorry for the late reply. The valve is the original check valve from when this car was from an eta. 90 degree or straight doesn't matter as long as it's put in the right way around. The brass pipe on the throttle body is plugged because I vented the charcoal cylinder directly to the air. My evap valve was faulty and I couldn't afford a new one. Hope this helps! This is exactly what I needed to see because my 90 525i throttle body has no part number for the elbow fitting and I cannot find the part ANYWHERE. Thank you so much for this. I made an account just to thank you and I am extremely new to this whole forum thing. And then just one hose going from the 90* check valve in the booster to the throttle body barb. 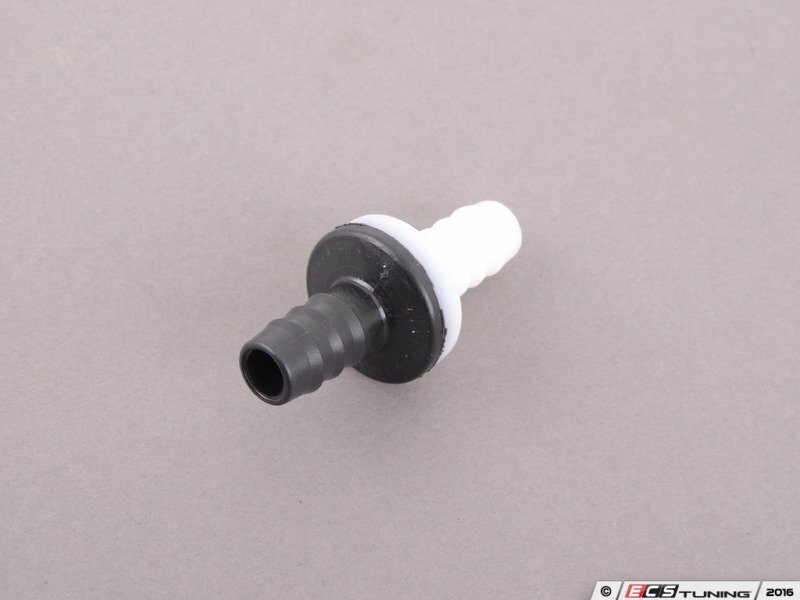 I just used a silicone plug on the extra TB elbow, then bought a generic check valve to put in-line. I coupled that with one of those silicone vacuum line kits for the lines. With the new intake boot. This is what mine looks like. Pretty sure I had the check valve the wrong way in this pic, lol. You could couple it with the tapped holes in the TB also, I would presume, to get a better seal at the TB. Obviously my method is much more half assed, but it got the job done. '86 Burgundrot 325 2.8 stroker. Does anyone have a similar repair for the ICV connection on the other side of throttle? Nice write up! I really like the idea of threading the holes. Its definitely a sound way to make sure they don't wiggle loose. My idea for improving the reliability of the vacuum hoses would be to solder the aluminum elbows directly to the throttle body. It could be the cheapest way to do ensure they don't wiggle loose. You could also fill the unused elbow with solder to act as a plug. Just my idea. I'll post pics if I go this route. I really like the silicone vacuum hoses that were posted by betz. I will definitely be going that route. That's not going to be easy to solder, the throttle body is a pretty big mass of aluminum, you're going to have to remove all the decades of oxidation on it too.